The Titular Hero, by MK Reed and Jonathan Hill. For a writer who got her start doing slice-of-life comics, Reed certainly has a talent for writing fantasy. 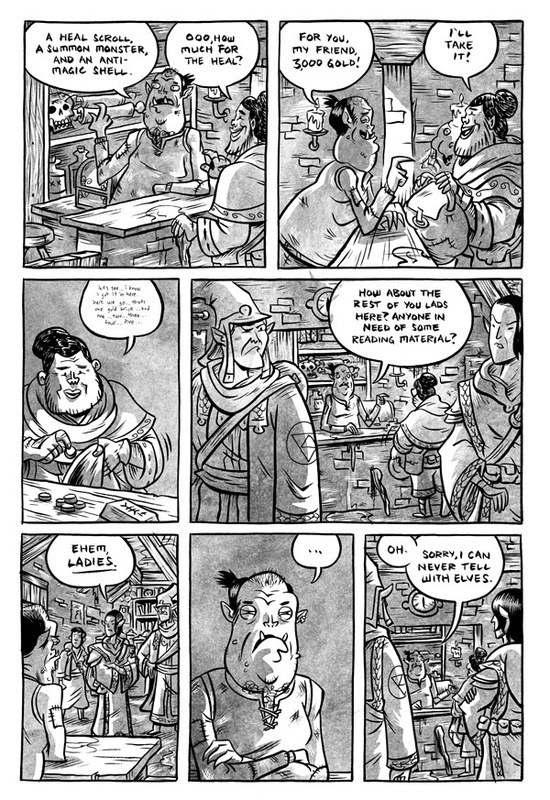 This mini that originally appeared online not only gets at the mechanics of being a fantasy adventurer, it also takes the piss out of the ridiculous amounts of sexism that pervades the genre. Hill can draw anything Reed throws at him, in this story about a party going to a seedy part of town and being exposed to certain seedy books. The "Lady Bosoms" title is a particular best-seller, and Hill drawing the spoof of big-breasted heroine while the adventurers critique it incredulously works quite well. Like all of the fantasy excerpts that Reed has written, I found myself wanting to find out what happens next with this group of characters. 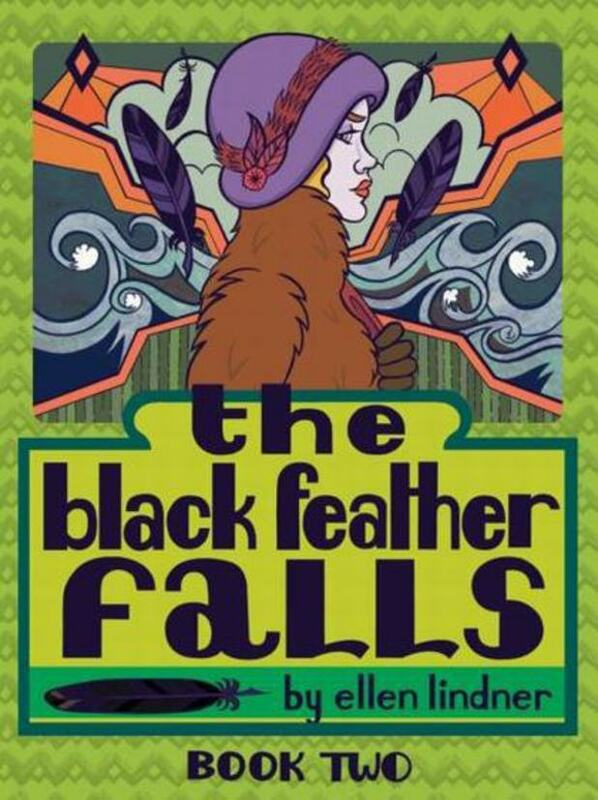 The Black Feather Falls, Book Two, by Ellen Lindner. 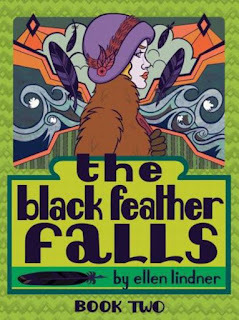 Lindner's elegant and stylish whodunnit continues, as her two female protagonists (a boutique worker and a secretary) follow the trail of a murder up to a remote island near Scotland. The book is part murder mystery, part buddy action story and part exploration of dark, personal roots. The two women overcome some rather extreme sexism in hilarious and dogged fashion as they piece together clues to essentially solve some of the whys and hows of the case, setting up the climactic third book. The story is really about trying to create a new identity and running away from one's past. In the case of Tina Swift, the protagonist, she hints that she was able to create a new life for herself after a life of abuse and horrible circumstances. Of course, the surprise ending of this book showed that she couldn't quite outrun every aspect of her past. Once again, the use of vivid and rich colors as well as the stylized character designs and lettering, give this comic a distinct and powerful sense of time and place. That's true of both the backgrounds but especially the fashions. Lindner is truly hitting her stride with this series. REM Pt. 1, by M.R. Trower. Speaking of leaping forward, REM is Trower's best work to date. 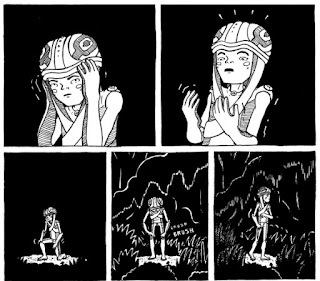 Like many of their comics, REM is a story about finding one's identity in a culture that demands that one fits into a set of rigorously defined categories. The story follows a young person named Rem who's about to go through the process of being sorted into a profession/caste by means of the mark placed their body by the "holy beast". When there's no mark to be found, Rem runs away, eventually finding safety with a group of fellow "deviants". The end of this chapter finds Rem embracing their new role, even as their future is uncertain. This is a story that begins with the nagging sense of not fitting in but that quickly moves on to its hero having a new sense of purpose, one filled with mystery, awe and wonder. 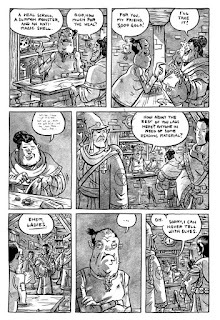 Trower lists Moebius as an influence, and that's apparent both in terms of the intricacy of the line drawings & character design, as well as the trippiness of the backgrounds. Moebius' stories also tend to be about transformation and struggle, though Trower's take on this is uniquely theirs.